Whether you love to blow through novels or need your own mini library of references close at hand, Le Bouc is there for you. Keep it under your desk, by your favorite reading chair or take it out in the yard so you’ll never be far from your favorite books. 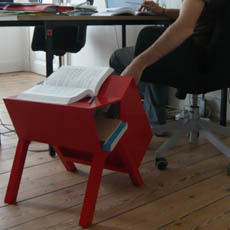 The unique shape of Le Bouc accommodates an open book, as well as a stack of things you want to set aside. The only thing that could make this snazzy red portable library better is a set of wheels.